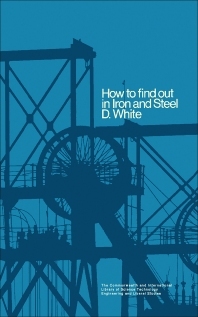 How to Find Out in Iron and Steel focuses on guides in conducting research on the manufacture and applications of iron and steel. The book first emphasizes the role of information services and libraries, literature guides, bibliographies, and periodicals in finding information on iron and steel. Topics include guides to sources of information; select lists of books and sources of information on books; and lists of periodicals. The manuscript then takes a look at the functions of periodical indexing and abstracting services in accessing information, including services dealing with science and technology; services solely focusing on iron and steel; and services dealing with the manufacture of iron and steel. The text also discusses the contributions of handbooks, dictionaries, monographs, treatises, textbooks, and standard works in conducting research on the two elements. English dictionaries that focus on a specific aspect of iron and steel technology, mechanical working, foundry practice, heat treatment, and mechanical properties and testing are underscored. The book also explains the different standards used in the manufacture and testing of iron and steel. The manuscript is a dependable reference for readers wanting to conduct research on the manufacture and applications of iron and steel.